At first glance, the McIntosh MTI100 Integrated Turntable may look like it’s just a turntable, but a closer look will reveal that it is in fact so much more. Besides the turntable that plays both 33.3 and 45 rpm vinyl records, the MTI100 also includes a power amplifier, a vacuum tube preamplifier section, a shielded phono preamplifier, an unbalanced auxiliary input, digital audio coaxial and optical inputs, a Bluetooth receiver, a subwoofer output, stereo speaker outputs for sharing your music with friends, and a headphone jack for personal listening. 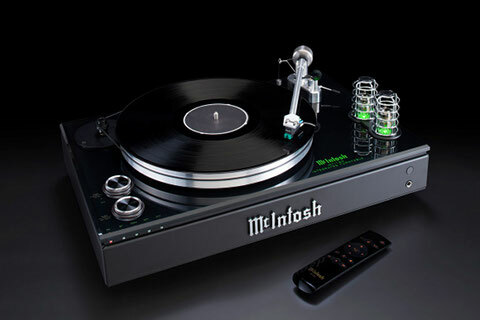 The turntable part features a 3.18 kg machined aluminum platter and a matching machined aluminum tonearm with anti-skate atop a 9.5mm thick piece of glass – the same glass found in the front panels of McIntosh's larger amplifiers; this in turn sits atop a custom a 6.35mm thick metal plate that adds stability. The combined heftiness of both the platter and metal plate helps resist and absorb noise that could be caused by external vibrations, the company says. It is a belt drive design with manual speed change, driven by an industrial grade, permanent magnet, AC synchronous motor with a 2 speed pulley. The MTI100 comes with a Sumiko Olympia MM cartridge. A Class D amplifier that’s rated for 50/80W per channel into 8/4 Ohm loads, features a two 12AX7 vacuum tubes preamplifier stage, and a phono preamplifier in a custom shielding box that prevents interference or noise from seeping into the vinyl signal. The user, can also stream music to the MTI100 via its High Definition Bluetooth 4.2 and use the analog line and digital audio inputs to connect external sources, such as a TV, tuner or CD Player. A subwoofer output is also included, as well as a headphone jack that is powered by a dedicated High Drive headphone amplifier.